Home should be where you feel the safest. 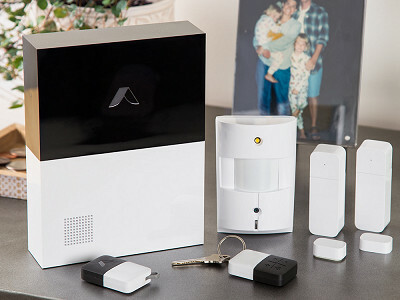 abode is a connected home security system that’s flexible and lets you monitor your space from anywhere. Founder Chris Carney spent 15 years in the security industry and created a system that overcomes all the drawbacks of the traditional hard-wired alarms. Set abode up and reconfigure it however you like. If you move, it comes with you, so it’s perfect for renters. Plus you don’t have to sign a monthly contract. If you want to add professional monitoring you can do so on-demand for as long or as little a stretch as you like—even for just a weekend away. You connect abode to your WiFi router. Its window and door guards and motion sensor camera pick up movements and send alerts to your device. And abode acts as a hub for other smart home devices like nest, wink, or Philips hue, making your connected home easy to manage right through the abode app. Whether home is an apartment or a house, this smart system will make you feel safe and connected, even if you’re not there. Hello Grommet community! 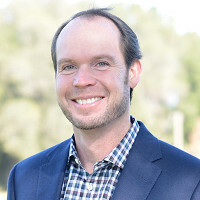 I’m Chris Carney, Co-Founder and Chief Executive Officer at abode. I am thrilled and honored to have our invention featured as today’s Grommet. My Co-Founder Brent and I set out to completely re-invent the home security and automation experience. We created abode to be the world’s first professional grade security solution that has no contracts and is extremely easy to install and use. Hello everyone! Thanks for visiting our launch page on The Grommet! We're excited to be showcased today and I'll be here answering any questions you may have all day. Don't hesitate to reach out and let me know if I can assist in any way. @Chris Hi - I've been looking into security systems & this sounds like a great option. But, since it connects to my wifi, what happens if there's a power outage? Thanks! @Michelle Thanks for the question. We actually connect to your home WiFi router via an ethernet connection. This is more stable and leads to better uptime. We thought through all scenarios, and introduced a 12 hour battery backup built into our gateway hub. We also offer cellular backup service (monthly service fee applies, $10 per month or $96 per year) to keep your security system online in the event of a power or internet outage. What makes your system different from the ones available (for less money) at the DIY type stores? @mindy - Thanks for your question! We are a silicon valley based company that is focused on constant innovation. Therefore we are doing many things differently like, not requiring monthly fees to use the system, providing excellent quality products (not commodity hardware from China), and emphasis on true physical security to protect your entire home, and we also include a free powerful home automation platform to allow you to make your home work for you. Our automation platform can do things like: Open the garage door when you pull into your neighborhood, automatically unlock your front door, or turn on the outside lights automatically when you return home. We are also integrating with many other products like Nest, Sonos, Hue, etc. @mindy - one other thing, the system is very expansive. You can add other types of devices like Locks, Thermostats, Lights, power switches, water sensors, etc. @Chris Sounds great. We have been looking for a system because we have not only our home on our property but a separate studio for my husband's business, and this is flexible enough to really serve us well. That it is, Mindy. Isn't it great when a product just shows up and solves a problem you're facing? We're looking into security for a vacation home. Would this work with a portable WIFI such as Karma? @Bob Hi Bob, you'd actually want to use the 3G connection in our gateway instead for reliability. We haven't tested Karma, but if you were to place an abode gateway in your vacation home, you could receive alerts if doors opened or closed, or if the alarm was triggered. Our 3G connection is built in and uses the AT&T or T-Mobile networks (whichever is stronger). Can you disable the motion detector if there are pets in the home? @carolyn Hi Carolyn, The motion sensor has pet immunity up to ~60 lbs. This enables pets to roam around at home without triggering the motion sensor. We can help you place the sensor at the optimal height for your use case in order to avoid false alarms. We also allow you the ability to by-pass individual sensors so that they will not trigger alarms in different system modes. @Daniel Thanks for your suggestion. We currently do not support windows phones. We do have a full web application, but the UI interface at the moment would not provide an optimal user experience on mobile. Thanks for the assist, Laura! What does your entire home safety program consist of. How much does it cost. @Harold - Each persons home is different. We provide a starter kit for $359 with a free service to start. The system can be build upon and services are optional. Thus, it puts you in control of the costs. We purposefully require the system be connected to the internet through an ethernet cable to prevent hacking of our system. All of the wireless devices that connect to the gateway are encrypted as well. We'd be happy to help you build a system that is perfect for your home. If I set up a camera to capture video, about what length of time can be stored? Do I need to clear out captured video or does it happen automatically as space fills? @Laura We provide you with 3 days of free video clip storage. The upgrade plans include 14 days and 90 days of storage for a fee/month, these plans include other benefits as well (cellular back up, and professional monitoring). The space is cleared out automatically. It only comes with 2 window/door sensors? I have 11 windows and 5 doors on the first floor of my home. I would need 16 in total? @Marie The starter kit comes with 2, but you are able to add on additional devices to your system. We would be glad to connect and help you build the system that is perfect for your home. You can find additional sensors to solidify your fortress underneath the story on the righthand side, Marie. I have an existing system that has wireless sensors at doors and windows, glass, etc. I believe Honeywell. Are they compatible with your system. @Eric Sorry, We do not support Honeywell wireless RF sensors. These sensors are vulnerable to being spoofed and hacked. We only support our sensors and the sensors on our compatibility list. The list includes Zwave & Zigbee devices. These protocols and our RF frequency are encrypted, which provides security from hackers. Does your system work with Comcast? @Sarah Our system would be plugged into the Comcast internet router, but would work on its own. We provide a free self monitored service option with all of the benefits of controlling your system remotely, adding door locks, lights, other connected devices without any very high monthly fees (totally optional services). Our goal is to help people get away from the long term contracts that cable companies and security companies trick people into signing up for with the "free equipment" sales pitch. We have very transparent pricing on products and services. @Chris , My techno-brilliant son, like you, lives in Silicon Valley. Which leads to my next question. I'm NOT techno-brilliant, and my son is too far away to set it up for me. How user-friendly is it? (Or "idiot-friendly. . .") Is there tech support? Will they use a supercilious tone of voice while communicating with people (idiots) like me? Hi Sarah, part of the beauty of abode is its easy setup. Of course, that is subjective and "easy to setup" is quite the sliding scale, but abode comes with setup guides to get you started and their site has an entire page dedicated to support for every step of the process. What a great idea! I need to be able to monitor a 6000sq.ft. property (church and residence). There are 16 ground floor windows and six doors to the outside. Can this system expand to cover this property. Hope you can help. All the additional cameras and devices you may need are underneath the story on the right side, Susan. Does it work with windows based phones or an internet connection? @Curt We currently do not support windows phones. We do have a full web application, but the UI interface at the moment would not provide an optimal user experience on mobile. The web app works beautifully though and is very feature rich. Hope that helps answer your question. To be clear, I could login to the internet and have access to the cameras? Would you please share with us the monthly cost for professional monitoring? @Val Hi Val, Sure. We have 3 plans. 1) The free plan - allows you to control your entire system add as many devices as you like, it comes with 3 days of timeline storage for anything that happens in your home. This plan also includes "on demand" monitoring, where you can choose to sign up for monitoring service for 3 or 7 day periods at a time. It's $8 for 3 days and $15 for 7 days. 2) The Connect Plan - This plan gives you everything in the free plan plus Cellular back up connection in case your internet and power go out, your entire system will still function. This is $10/month if paid monthly, or it's $8/month if you pay annually. 3) The Connect + Secure Plan - This plan gives you everything in 1 & 2 plus it includes professional monitoring. This is $30/month if paid monthly, or it's $20/month if you pay annually. All plans can be cancelled at any time. I don't see a "break glass" detector in your product line. Is one available? Also, you mention "free self monitoring". Would you elaborate on that, please? Is contract monitoring available, and at what cost? Thanks. @Tom Please see last answer for the plan question. We do have 2 types of glass break sensors that can be added to your system. One is a shock/vibration sensor and the other (which will be released in July) will be am acoustic glass break sensor that can cover rooms with multiple windows. @Robert We are currently working on fire integration. We have a fire / smoke detector that will alert you in the event of a smoke or fire signal directly to your phone, but are working with our partners to include this in the professionally monitored service. @Chris - How many cameras come in the starter kit? How many additional cameras will this system support? @Maureen - The starter kit includes one motion camera that takes still photos of the motion event that triggered the alarm. You can also use it as part of an automation rule as well for example, if a door opens, take a picture. I love this concept ... however, I use a mobile modem at my home, no router. Would I still be able to use abode? @jane - Thanks for the question. In order to experience all of the features (i.e. live video with the streaming camera) you will need a broadband connection. You can use the 3G portion for alerting (doors opening / closing, etc) and alarms. Chris, You infer in the trailing response that you product is not a commodity product from China, but your specs read "made in Tiawan. Please clarify. @EL - We assemble in Taiwan and we use high quality electronics. I should have been more clear, my apologies. While Apple designs in California and has very high standards on precision, they also manufacture in China. We are very similar in how we operate. Industrial design is very important to us and the quality of the hardware builds we put out are consistent with the brand we are building. Hope that helps! Chirs, I have a DropCam/Nest camera inside which works great. I like the fact the cam can LEARN things so not to give false-positives. Does your cam "learn"? (I have a FlirFx outside which works poorly because it CANNOT learn anything so I get alerts and recordings of all bugs, sun going in and out, rain drops, snow, etc.) Lastly, do you have any outdoor camera? @Chris Thanks Chris....all good info...and QUICK too. I'll now consider adobe! @Jeffrey Thanks! Don't hesitate to let us know if you have any other questions! Can you purchase/use the Live Stream Home Security Camera by itself and use it with your app? We have a security system but not a camera. Thanks! @Lyla - Thanks for the question. Not today currently, however we are working on this functionality in a future release. My house is very old and most of the doors and windows are quite drafty and move quite a bit with the wind. Would this be an issue? If you say no and it subsequently is, can the items be returned for a refund? @Cecil - Yes, we offer a 30 day trial, no risk to you! Hi Chris. I live alone so I don't think I need to two (2) remote keys & wondering if I could swap for a window sensor instead? Also, is the key remote the only way to arm/disarm the system? No keypad required? @Carolyn Hi Carolyn. I would like Mike at the Grommet to approve that swap. I am okay with that from my end. Also - we do offer a keypad. It is not needed to use the system, but some people like to have that as part of their system. I'd be happy to help you build a system that meets your needs. Thanks! Hi Chris, thanks for the comment. At the moment, we aren't built to take on customization on site, but if that is something enough people are interested in, we can certainly look into it. I have a question, is the key fob the only way to arm and disarm the system. What happens if I am away and have the system armed, and i want my daughter to go into the house and do something or get something? Hi Lewis, you can use the key fob or the app to arm and disarm the alarm so you can let your daughter in from anywhere. Home should be where you feel the safest. 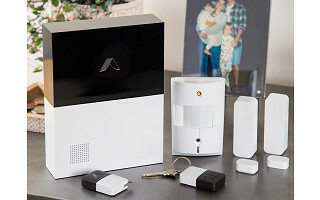 abode is a connected home security system that’s flexible and lets you monitor your space from anywhere. Founder Chris Carney spent 15 years in the security industry and created a system that overcomes all the drawbacks of the traditional hard-wired alarms. Set abode up and reconfigure it however you like. If you move, it comes with you, so it’s perfect for renters. Plus you don’t have to sign a monthly contract. If you want to add professional monitoring you can do so on-demand for as long or as little a stretch as you like—even for just a weekend away. You connect abode to your WiFi router. Its window and door guards and motion sensor camera pick up movements and send alerts to your device. And abode acts as a hub for other smart home devices like nest, wink, or Philips hue, making your connected home easy to manage right through the abode app.